1020 Sunridge Trl Pevely, MO. | MLS# 15055957 | Homes for Sale in St Charles, St Louis, Lincoln and Warren Counties! Looking for a Free Foreclosure List? Call Cheri Peterson 314-283-7251 Our Team is on the Leading Edge when it comes to Technology! Unbelievable Value! Look what you can buy for under 100K! This AFFORDABLE Spacious 4 Bedroom Home Features Vinyl Siding, Architectural Roof, Enclosed Soffits & Fascia, Newer Windows, Newer Driveway & Sidewalks, Fenced Yard & A Covered DECK ...........a Perfect Place for your Morning Coffee. Built in Blinds in Door to Deck. Inside you will find White 6 Panel Doors & Trim, Hall Bath w/Updated Vanity, Spacious Eat In Kitchen w/Refrigerator to Stay, Ceramic Tile Backsplash, Gas Stove & Additional Cabinets & Storage Added. All the Bedrooms have Ceiling Fans. Spacious Living Room with Iron Rail and Spindles. Neutral Paint Colors thruout awaiting your personal touch. 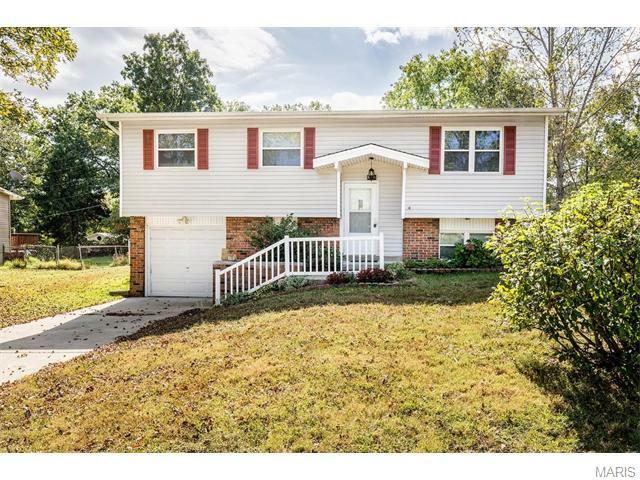 Water Softner, Immediate Occupancy available.This Home is Clean Bright & Open. Come make the Discovery!